Authentic Tacos in Downtown Seattle?? It's not often you get really authentic Mexican food in Seattle, except for the occasional taco truck or cuisine specific to a certain region. But Barracuda Taqueria was a great find on the edge of Belltown that I just had to share. 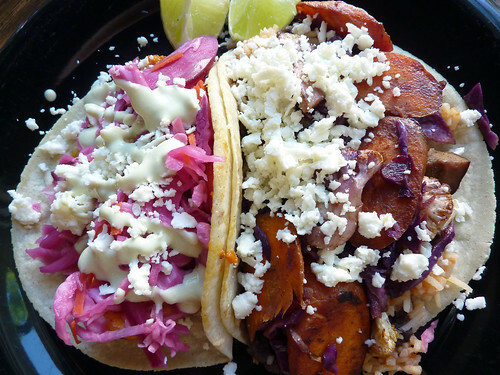 Specializing in real street food tacos, they add their own twist to each of their menu items with homemade condiments and super fresh ingredients. I devoured two fresh handmade soft tacos: The Chile Lime Shrimp which had fresh shrimp sauteed with chiles de arbol and deglazed with lime juice, topped with their own cabbage slaw and avocado lime crema. And The Vegetarian with rice, black beans, and a mix of sauteed seasonal vegetables typically including market fresh wild mushrooms and squash. Topped with salsa fresca. I never thought the variety of sautéed vegetables would be good in a soft taco, but they were! Everything was so fresh and flavorful. The cabbage slaw was so deliciously tangy and crisp, if they sold it by the jar I'd probably end up buying a whole case of it. We also ordered their chips and salsa which had a lovely light crunch and the salsa you could tell was homemade with a HOT spicy kick. If you ever find yourself at the west end of Denny, check out Barracuda! You have to admit, this is pretty cute. But I think at this point, if I get one more thing that links me to cupcakes solely I will go nuts, hehe. But you can get yours HERE! Okay how cool is this?! I have super limited space in my kitchen, so I love stuff like this that can contain everything. I love the fun colors too! Not bad for $49.95. Need a foolproof pie crust? Well thanks to my mother-in-law here it is! And it's made with Vodka! Vodka is essential to the texture of the crust and imparts no flavor, do not substitute. This dough will be moister and more supple than most standard pie doughs and will require more flour to roll out (up to ¼ cup). 1. Process 1 ½ cups flour, salt and sugar in food processor until combined, about 2 one-second pulses. Add butter and shortening and process until homogenous dough just starts to collect in uneven clumps, about 15 seconds (dough will resemble cottage cheese curds and there should be no uncoated flour). Scrape bowl with rubber spatula and redistribute dough evenly around processor blade. Add remaining cup of flour and pulse until mixture is evenly distributed around bowl and mass of dough has been broken up, 4 to 6 quick pulses. Empty mixture into medium bowl. 2. Sprinkle vodka and water over mixture. With rubber spatula, use folding motion to mix, pressing down on dough until dough is slightly tacky and sticks together. 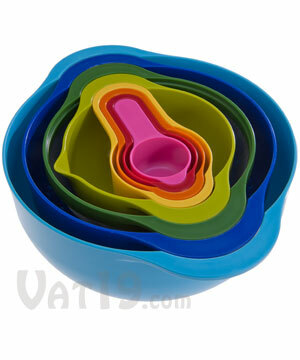 Divide dough into two even balls and flatten each into 4 inch disk. Wrap each in plastic wrap and refrigerate at least 45 minutes or up to 2 days. 1. Mix ½ cup sugar, ¼ teaspoon cinnamon, remaining ¼ teaspoon salt and cornstarch in large microwave safe bowl; add apples and toss to combine. Microwave on high power, stirring with rubber spatula every 3 minutes, until apples are just starting to turn translucent around the edges and liquid is thick and glossy, 10 to 14 minutes. Cool to room temperature, about 30 minutes. 2. While the filling cools adjust oven rack to lowest position, place rimmed baking sheet on oven rack, and heat oven to 425°. Remove one disk of dough from the refrigerator and roll out on generously floured (up to ¼ cup) work surface to 12 inch circle about 1/8 inch thick. Roll dough loosely around rolling pin and unroll into pie plate, leaving at least 1 inch overhang. Ease the dough into the plate by gently lifting edge of dough with one hand while pressing into the plate bottom with other hand. Leave dough that overhangs plate in place; refrigerate until dough is firm, about 30 minutes. 3. Transfer cooled apple mixture to dough-lined pie plate and mound slightly in the center. Press down any sharp apple edges. 4. Roll second disk of dough on generously floured work surface (up to ¼ cup) to 12 inch circle about 1/8 inch thick. Roll dough loosely around rolling pin and unroll over the pie, leaving at least 1 inch overhang on each side. 5. Using kitchen shears, cut evenly trough both layers of overhanging dough, leaving ½ inch overhang. Fold dough under itself so that edge of fold is flush with outer rim of pie plate. Flute edges using thumb and forefinger or press with tines of fork to seal. Brush top and edges of pie with egg white and sprinkle with remaining tablespoon sugar. Using sharp paring knife, cut four 1 ½ inch slits in top of dough in cross pattern. 6. 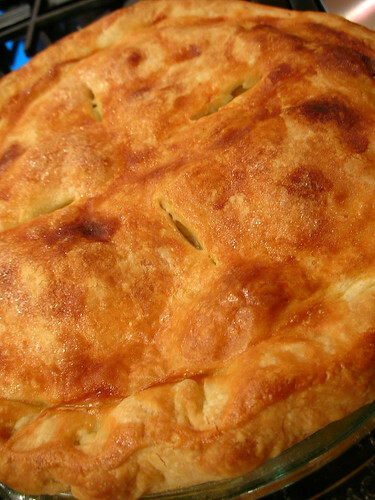 Place pie on preheated baking sheet and bake until top is light golden brown, 20 to 25 minutes. Reduce oven temperature to 375°, rotate baking sheet, and continue to bake until crust is deep golden brown, 15 to 30 minutes longer. Transfer pie to wire rack to cool at least 2 hours. Cut into wedges and serve. Whoopie Pies a big Whoop! 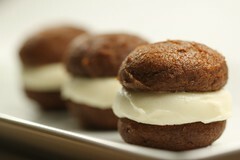 You know it was bound to happen, but the new craze after Cupcakes seem to be the classic Whoopie Pie from the 1920s. You never know how quickly these things will catch on or in what state (because I think the East Coast has been doing this for awhile), but here in Washington they are about to take off. I think they tried making the gourmet ice cream sandwich the new popular sweet a few years ago in the Northwest, but it never caught on - surprise, we love ice cream but may not want it in the middle of winter! Certainly handmade ice cream has received much attention and popularity, but I'm not sure it's gained the momentum yet that cupcakes have. Really, a Whoopie Pie seems like just a different variation of a cupcake where you twist off the bottom of a cupcake and flip it on top making a sandwich-like item. It's just now with these pies, they're a perfectly round little delicious bundle! As far as I know you can make it with cookies or with round cake pieces. If you do a search on Flickr you can find many many whoopie pie creations and I encourage you to do so! Seattle is overflowing with cupcake places. Seriously, just when you think you have a favorite another one pops up with stranger and stranger combinations of flavors to make you go "what?? I MUST HAVE THAT BECAUSE IT'S SO WEIRD!". In the beginning there was Shnoo Cupcakes (Part of Shnoo Yogurt), across from Century Square at Westlake Park in Seattle. I actually didn't think they were that bad (maybe a tad dry) and I loved their sugary icing. There was also Cupcake Royale. Not that partial to them, I thought their cupcakes were dry and uninteresting but I still ate them because they were the only ones in town at that point. Then along came Trophy Cupcakes, a better alternative because they were moist and their brilliantly piped icing topped interesting and sometimes kooky flavored cupcakes. I suppose being featured on Martha Stewart wasn't too shabby of them either. But wait, what's this? HEADLINE: Cupcake Royale Changes Their Recipe. OMG, THEIR CUPCAKES ARE SO MOIST! And what a new slogan, "Legalize Frostitution", making you aghast at first glance of the words on their new tshirts, until you realize it doesn't say "prostitution." Okay, whew. Yea, their cupcakes are way better than they were before. Nicely done guys! And what about 2 of the most well known and delicious bakeries in town: Dahlia Bakery and Macrina Bakery? I really have to say they are worst of the lot for cupcakes. You guys can make a killer crust for a pie, amazing bread and sweet loaves, but good lord your cupcakes are dry and your icing tastes like whipped flavorless butter. I like my frosting to taste like it did as a child: Sugary goodness and that certain familiar texture of butter whipped with icing sugar. Some people don't like it too sweet, but in these cases the icing does not help their dry cake and they really do just look pretty in the display case. That is all. The latest in the running for fast growing cupcake places is The Yellow Leaf Cupcake Co. right in the heart of Belltown. Their flavors are well thought out, choosing to have a more sugary cake and less sugary icing. See, I like it the other way around: Flavorful and slightly sweet cake with the icing being more sugary. So they aren't the highest on my list for favorites, but they do make a darn good moist cupcake and seem to follow the trend of making flavors that fit the season. I still have yet to try Wink Cupcakes in Queen Anne, so if anyone wants to send me a box that would be A-Okay by me. I will update this post with new places that pop up as well, or if you have any other recommendations around town. So even if you're against those cute little cakes that are all the rage, get over it and just stuff yer face with one! And better yet, watch this video before you do so you get it right!